brief had to be met exactly”. In 2007 Goodwood opened its restored historic downland golf course and with it their beautiful 18th Century Kennels Clubhouse. As home to the PGA Championship and very high levels of corporate and society hospitality, every detail on the Downs Course is considered. 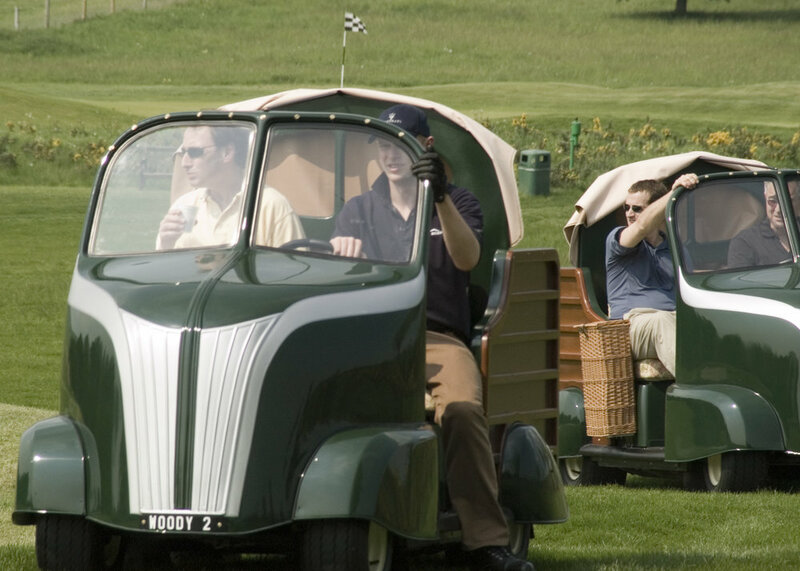 So, rather than entertain standard ‘plastic’ golf buggies, the Earl of March commissioned Dance to build bespoke buggies based on a vehicle his grandfather, the 9th Duke of Richmond, had designed and built in the 1930s. That revolutionary car was called the Brakenvan and it was distinctive for its then-groundbreaking commodious design and ash-wood framed body. After trying to build a scaled-down replica of the Brakenvan it soon became clear that a broader interpretation was required. 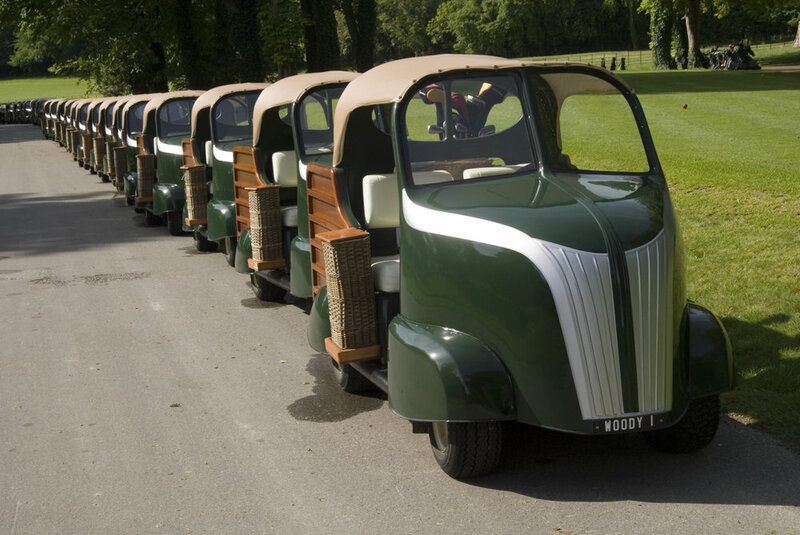 Practicality, Health and Safety and Type Approval, quite apart from the innumerable aesthetic tweaks, meant 4 prototypes were built before the final shape of the Woody Golf Buggy was approved. Factors like wheel-size were a big aesthetic obstacle, an issue finally overcome by developing ‘aerodyn’ spats to cover them. In fact, during development the Woody Buggy became ever-more ‘aero’ in design, while retaining the original wooded slat features of the Brakenvan. 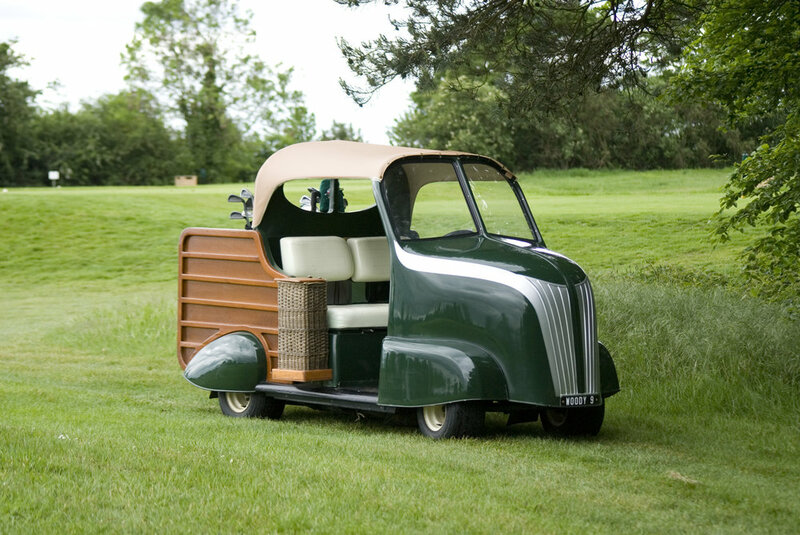 Innumerable practical factors found clever solutions, not least the addition of whicker champagne and umbrella baskets to the sides of the seats, their positions ensuring occupants wouldn’t fall out on steep bunker gradients. The initial budget and schedule was very tight. 20 buggies had to be made in 20 weeks and 36 in total within 32 weeks. The results were a total success. Used daily, the Woodys haven’t deteriorated at all. They were all built to a very high standard of fit and finish and they have become an integral part of the image of golf at Goodwood. The Woodies at the Goodwood Kennels created a lot of interest from other potential customers wanting to buy replicas. Being an exclusively Goodwood design, Dance then experimented by building a scaled-down replica of a Fiat 500 Jolly – the 1960s open-topped version of the Fiat 500 saloon built in period for recreational purposes. The 500 Jolly buggy involved quite a lot of platform re-engineering, not least to get the seating position low enough. Battery locations and drivetrain elements were modified in order to retain the original Fiat 500 Jolly’s proportions. The result was very successful and Dance presented the running prototype to Lord March as a surprise gesture for his exclusive use at one of Goodwood’s premium annual events – the 2008 Goodwood Revival. While serving as Lord March’s excusive Revival transport, the buggy caught the eyes the top brass from a major manufacture in Italy who borrowed the Dance 500 Jolly to take to the 2009 G8 Summit in L’Aquila, Italy. Enthusiastically received, the project was ripe for series roll-out (500 were proposed) but the idea was not pursued for economic reasons.